Dual-motor all-wheel drive off-roader to join the ranks of I.D.? Klaus Bischof, Executive Director of Volkswagen Design, hinted at the I.D. 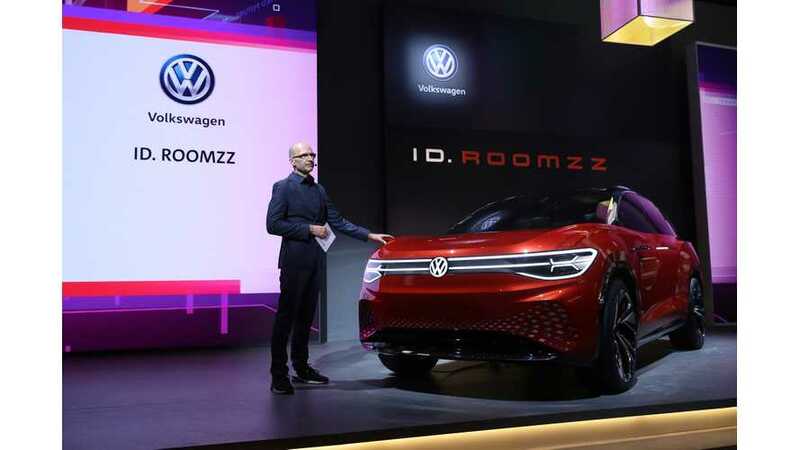 ROOMZZ unveiling event, that the next Volkswagen I.D. family member could be not only all-electric, but envisioned for off-roading. The "rugged electric 4x4" also would be based on the MEB-platform. "Speaking on the eve of the Shanghai motor show, where the firm launched a new ID Roomzz large SUV concept, Bischoff responded to a question about Volkswagen producing a more traditional MEB-based 4x4 by saying: “Maybe one of the next ID family members is a more rugged thing than we have seen."" The Volkswagen I.D. BUGGY concept from Geneva already proved off-road EVs are in the area of interest, but it was more like a demonstrator of low-volume models for 3rd party manufacturers, that would be using the MEB platform. This time the true off-roader would be similarly sized to the I.D. CROZZ/I.D. ROOMZZ. Bischof added that the problem with off-road EVs is that you need to make them higher and more boxy, which harms aerodynamics and can cut 60 km (37 miles) of range. It's interesting that Bischof stated precise range loss, which suggests that VW already did some simulations. "“The higher and more boxy you go, the harder the aerodynamics are - it's the biggest hurdle,” he said. “You can lose 60km of range by doing this.""